San Diego is known for beautiful beaches and year round pleasant weather, plus, yes, soul food. Soul food in this predominantly Mexican food environment is here. There was a time when many soul food and barbeque restaurants lined the streets of southeast San Diego. Today, most of those original places are gone but soul food and barbeque restaurants are making a comeback and I found three places truly worth a try. Bradrick Cooper began his barbeque restaurant when he realized San Diego didn’t have the right style of authentic barbeque and knew it was time to open his own place. After searching for restaurants for sale, he found his current location when he laid eyes on the smoke pits. Cooper learned to cook at his grandmother’s knee by helping her cook beans and rice and with his mother, he picked the greens and stirred the gravy. His dad taught him barbequing techniques and all this combined family training has made his restaurant the talk of the town. Opening the brick and mortar restaurant didn’t happen overnight. He peddled his foods inside beauty salons and other places until he had a following and then took the next step and invested in a restaurant. Word of his brisket, ribs and buttermilk pie spread around the city and then fried chicken came to his mind. Cooper grew up on fried chicken and with the demand on the horizon, he bought the building next door and turned on the fryers. Fried fish, gizzards, okra and chicken keep his walk-up window hopping. I gathered my friends, some from the South, and we tried just about one of everything from the menu. From the sounds of “yum” and “oh yes,” the brisket, greens, ribs and pie passed with approval. The craving for fried chicken came over me weeks later and I returned to Da Chicken Coop. Two upstanding community leaders ordered fried catfish and chicken wings and sat outside as we talked. They were happy a small business owner such as Copper served his food in a neighborhood hungry for more. Getting there is easy using Uber or Lyft and there is limited trolley service on the Orange line. Don’t be surprised when arriving if the parking lot is full of fire trucks, police cars and Mercedes because they also know good food when they taste it. Both restaurants are open Tuesday – Friday 11 am – 9 pm, Saturday and Sunday 11 am to 8 pm and closed on Monday. You wouldn’t think of a popular Louisiana café being located in a business park area of San Diego, but customers craving gumbo find their way here. Bud Deslatte, owner and chef of Bud’s Louisiana Café, has been cooking Cajun/Creole-style food for twenty plus years in San Diego after moving west from the Big Easy where he skillfully learned his trade. 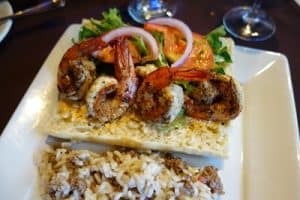 On the day I dined at Bud’s, his business partner, Rob, told me “Southern food” is the big umbrella and New Orleans food has its own distinctive manner. Oh yes, plenty of shrimp po’boys and catfish but no greens or mac ‘n’ cheese. 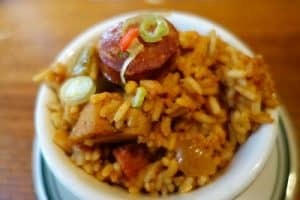 Serving authentic food is most important and he has crawfish, Tasso ham, alligator and andouille sausages regularly flown in. The signature seafood gumbo was placed before me and the cup was brimming with shrimp, crawfish, sausage, okra and rice. I then moved on to A Taste of New Orleans which was a hearty plate of mouthwatering crawfish etouffee over rice and a fried soft-shell crab. The foods were pleasantly spiced and bathed perfectly in a roux-based, house made sauce. Meals can be enjoyed inside the subtlety decorated restaurant or on the outside patio to catch a typical San Diego breeze while munching on a warm beignet. Breakfast is served Monday-Friday 7 -10:00 am. Lunch is Monday and Tuesday 10:30 am-2:30 pm Lunch and dinner on Wednesday, Thursday, Friday is served from 10:30 am-9:00 pm, Saturday 12 -9 pm and closed Sunday. Uber and Lyft are the best transportation options to use. Jazz music and spirited singers entertain during dinner at Bourre` Southern Bistro in the Rolando area of San Diego. It is a supper club reminiscent of the old times where eating comfort food and swaying to live music make for an enjoyable evening. Mark Jensen and Gil Johnson, together with their wives, oversee the food coming out of the kitchen and the guests’ satisfaction with music, drink and food. Open jazz sessions are the first Thursday of the month with drop-in local talent and even a Grammy Award-winning artist who blend their talents much to the liking of dining patrons. I recently joined others on a busy Saturday evening while Michele Lundeen, known as “The Queen of Steam,” belted out songs while we finished our meals. People didn’t want to leave their seats and meanwhile a line formed outside with others waiting to come in. Jensen told me his motto is to treat people like you would like to be treated and its obviously working here. Reservations are a good idea for this intimate dining scene. Alcoholic drinks are served on performance nights only and the crispy fried green tomato appetizer served with Cajun aioli sauce set the tone. Although it was dinner time, I ordered the highly recommended chicken and waffles. The coating on the chicken was light and flavorful. Bourre’ calls itself California Creole and Southern food with a twist, like the stuffed pork chop and short ribs. Watching the orders being delivered, jambalaya, gumbo, shrimp po’boy and dirty rice were in high demand. And of course, the meal had to be completed with bananas foster and pecan pie. Bourre’ is available for special events such as birthdays, graduations and anniversary parties. Dinner is offered Wednesday through Saturday 5:00-9:00 pm and Sunday 1-8 pm. Uber and Lyft are the best options to use for transportation. San Diego’s barbeque and southern cuisine restaurants bring to mind lazy days sitting on the porch with a glass of sweet tea, yet transported to the west coast.